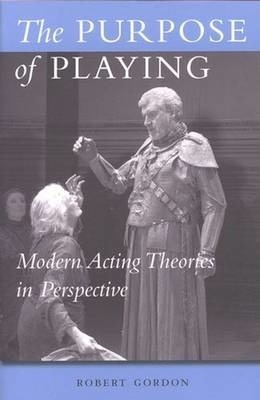 The Purpose of Playing is the first book to analyze and synthesize modern critical acting theories, their historical evolution, and their relationship to one another, enabling students, teachers, and professionals to comprehend the different aesthetic possibilities available to actors today. Robert Gordon identifies six categories of twentieth-century acting, each of which constitutes a different tradition of performance: realistic characterization, visual/ scenographic emphasis, improvisation and games, political theater, self-exploration, and cultural exchange. Theorists discussed include: Stanislavski, Chekhov, Meyerhold, Copeau, Laban, Brecht, Artaud, Grotowski, and Michael Brook, among others. "This analysis of major movements and figures from the early nineteenth century to the pre sent is clear, thorough and penetrating, and its scope across periods, countries and styles is impressive." - Xerxes Mehta, University of Maryland-Baltimore County"
Robert Gordon is Reader in Drama, Goldsmiths College, University of London.